Specialist environmental and waste management PR and marketing communications consultancy Pelican Communications looks at changing consumer attitudes to Pay As You Throw (PAYT). With the States of Guernsey announcing plans to introduce a pay-as-you-throw (PAYT) system for residual household waste from 2019, the issue of how we fund domestic recycling is back in the headlines. As an island, Guernsey, clearly has some particular waste management challenges, but it’s decision to adopt PAYT, does raise the questions: what are the chances of the system being rolled out across the UK mainland? And, what’s more, does the PAYT model offer a way of boosting the UK’s sluggish recycling rate and would householders accept its introduction? To find out, waste management PR and environmental communications consultancy Pelican Communications commissioned research with 1,000 UK households to understand their attitudes to recycling and paying for what they throw away. 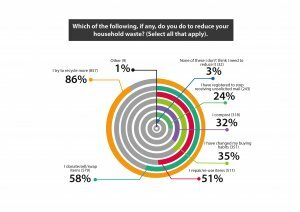 A new survey of 1,000 householders from waste management PR and environmental communications consultancy Pelican Communications looks at consumer attitudes to paying for what they throw away. Recycling rates in the UK rose faster in the first decade of the millennium than any other country in Europe. Although the UK started from a low base in 2001, when recycling rates were just 12% for all municipal waste, by 2010, it had reached 39%, on a par with the average for the EU. Since then, the rate of increase has slowed and recycling rates for household waste across the UK have stagnated around the 45% mark, apart from Wales, which reported a rate of 64% in the 12 months to March 2017. 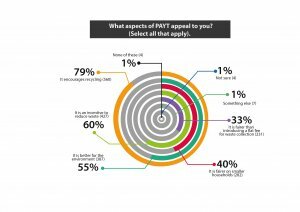 To find out if PAYT offers a route to increase recycling, Pelican Communications commissioned research with 1,000 UK households to understand their attitudes to recycling and paying for residual waste. Despite the slowdown in recycling rates, UK householders are in favour of recycling, with 89% of the survey respondents saying recycling was important or very important to them and 86% saying that they are trying to recycle more. 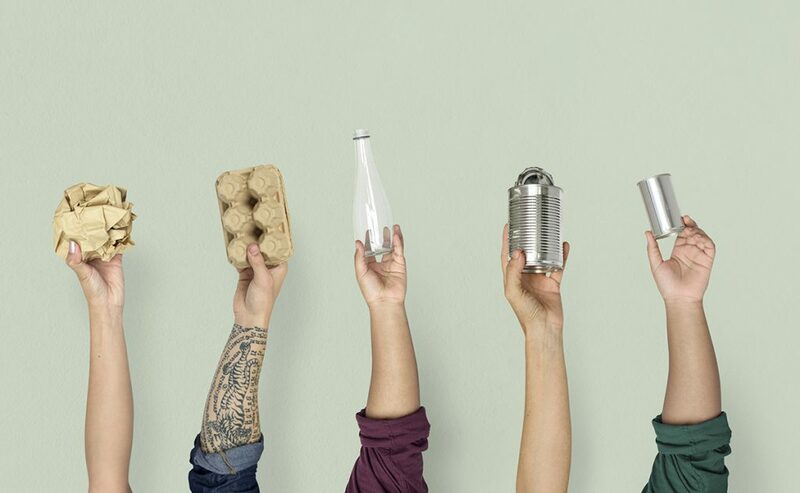 What’s more, one in three say they have made changes to their shopping habits to reduce waste, 51% say they repair and reuse items and almost 60% say they donate or swap items. Readers may be somewhat sceptical, as when asked, most people overstate their enthusiasm for recycling, however, it’s still the case that most people participate and are in favour. With a largely positive attitude to recycling, are householders in favour of PAYT? 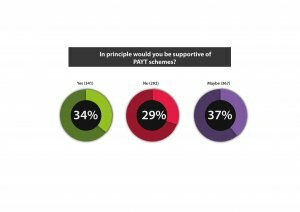 Unsurprisingly the survey reveals that 86% of respondents hadn’t heard of PAYT, but once the system was explained to them, 34% were in favour, with 37% saying that they might be in favour. The possibility that PAYT would encourage more recycling was cited as the main appeal of the system by 79% of the respondents. The perceived fairness of PAYT also appealed to many respondents, with 40% saying that it is fairer on small households and one in three saying it was fairer than introducing a flat fee for waste collection. Increased expense, fly tipping and people dumping rubbish in neighbours’ bins were cited as key objections by the 29% not in favour of the idea. Concern that it would not be affordable for people on lower incomes was also a worry expressed by 62% of those against PAYT. However, attitudes to PAYT changed when all householders surveyed by Pelican Communications were asked about increased product consumption, reduced waste and increased recycling. Sixty per cent of those surveyed said they would be more supportive of PAYT if it was guaranteed to tackle increasing waste production and product consumption. This went up to 65% being more supportive if PAYT schemes were guaranteed to increase recycling and have a beneficial environmental impact. The survey also asked householders about their preferences for PAYT alternatives, with 45% saying they would prefer rewards or payments to encourage more recycling. Interestingly reward schemes have been shown to have limited effect on increasing recycling rates. Respondents were also asked if they felt recycling services should be treated as a utility, allowing them to change suppliers and find cheaper options. Thirty one per cent said they felt it was a terrible idea, whilst 11% said they would like this option to be available now. A further 18% said they felt it would be a better option that PAYT. This research highlights the importance of winning hearts and minds. If councils are considering introducing PAYT they need to ensure they make a convincing environmental case for the system and that they can demonstrate that such schemes deliver positive environmental results. In addition, they need to be very sensitive to the concerns of the third of respondents who are concerned about increased costs and the adverse effects on lower income households and ensure the system is equitable. Tough measures will need to be put in place to tackle waste crime and prevent larger households dumping their rubbish in other peoples’ bins. With local authority budgets already stretched, there is little chance that money will be available for enforcement, but this is just the kind of issue that can make or break a system in the minds of residents. 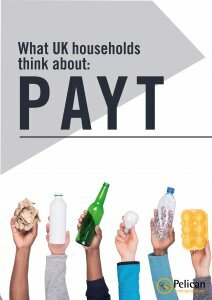 PAYT has the potential to give household recycling in England, Wales and Northern Ireland a much-needed shot in the arm. The concept already appeals to one third of households and when the potential environmental benefits are explained in more detail, support jumps to over 65% of the sample we surveyed. However, there are significant educational, legal and political challenges that will have to be overcome and only a very committed council would embark on its introduction without funding and political leadership from a city region, devolved administration or national government.